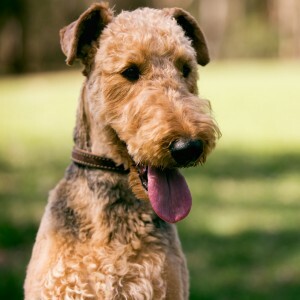 Macy is an Airedale Terrier, who is almost five years old. Her best trick is a classic – it’s where she pretends not to hear Dr Kevin’s call or instructions. That is, until the treats come out and then her ears are magically open! Macy is relatively healthy aside from a sensitive stomach and allergies. Dr Kevin has to keep her diet relatively bland, despite her insistence that she would be fine with leftover lamb, otherwise she develops colitis (inflammation of her bowel) for a few days. Macy is also allergic to fleas, if she misses her monthly flea treatment the itching of her backside and licking of her feet becomes quite intense. Macy’s favourite toy is a very squeaky and noisy rubber hedgehog. Dr Kevin has to keep a supply of them at home otherwise when she exhausts the squeak the fun is over!